My last few days in New York were mainly spent at a work conference in Brooklyn. There were still a lot of opportunities to dine well though! Lunch one afternoon was at Hill Country Chicken, next door to Hill Country Barbecue Market. 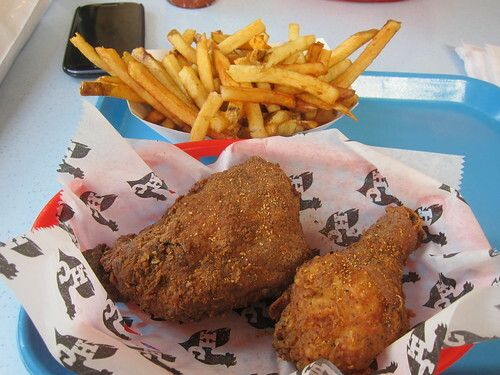 Their fried chicken was good but not a patch on that at Pies ‘n’ Thighs. I’ve been told I should just get fried chicken at Popeyes rather than these ‘fancy’ places though! That night, I made my way to Chinatown where I went in search of a branch of Xi’an Famous Foods. 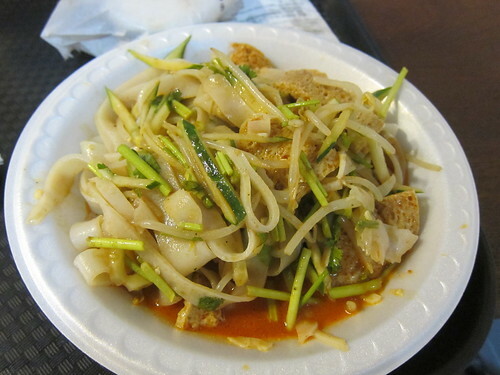 Their famous liang pi cold skin noodles were excellent and the kind of light comfort food that was just what I needed. 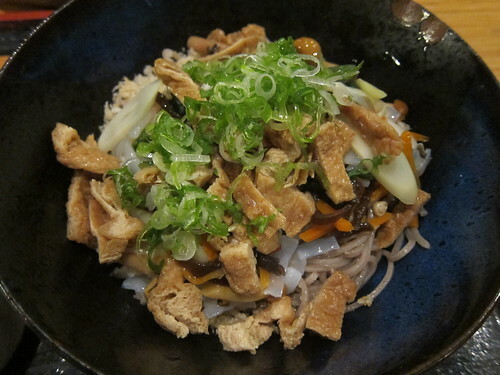 The slippery noodles had been tossed with a vinegary chilli sauce with lots of shredded vegetables and bits of gluten. 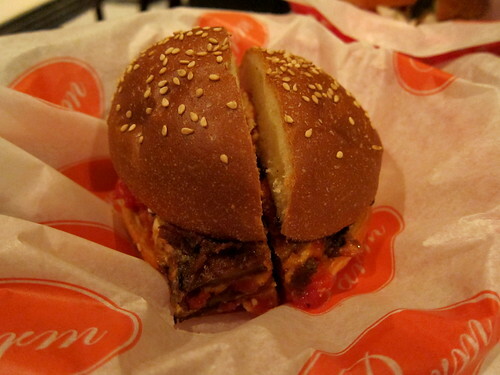 I also ordered a spicy cumin lamb burger, another of their popular dishes. It was quite spicy but I felt that the lamb was a bit on the dry side; I would have preferred a bit of fat in there to give it all some moistness. The next night, I was looking for a real New York institution as I was taking a guest out (hi, A!) 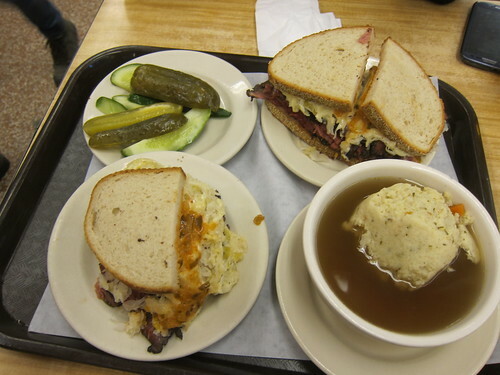 and Katz’s Delicatessen came to mind. I’d not tried it and we were not disappointed! 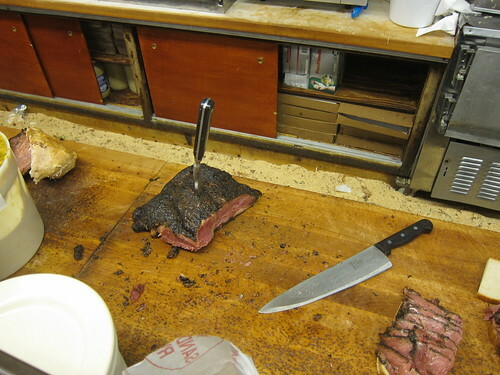 That pastrami was excellent! For me, I chose a soup and half sandwich combo. 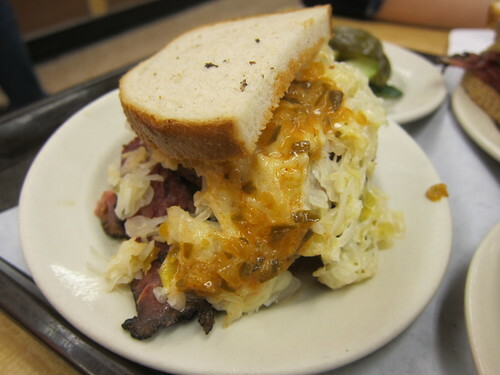 For the sandwich, their pastrami reuben, with plenty of pastrami topped with sauerkraut, melted cheese and Russian dressing. It nearly defeated me. 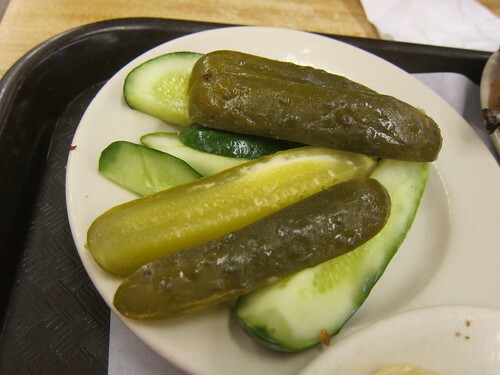 On the side were two pickles – a very sour dill pickle and my preferred half pickled but still very crunchy pickle. 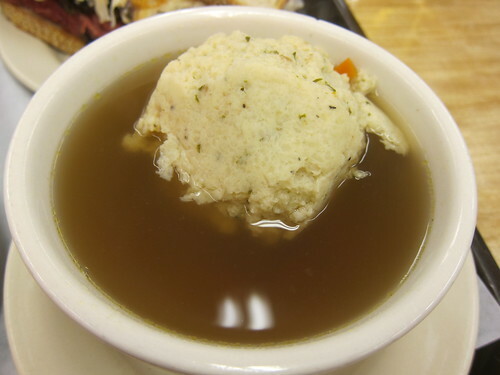 My matzo ball soup was just ok – its chicken broth was just good enough. I had to leave most of it. We clearly over ordered. We ordered fries and I think we only had one or two. 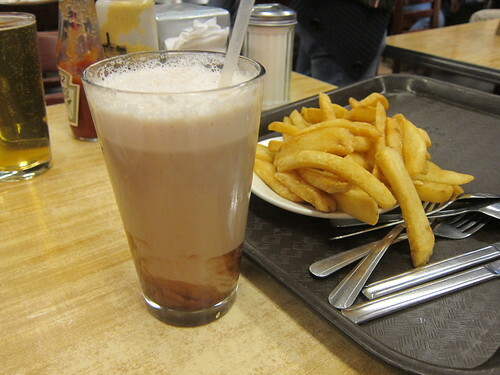 To drink, I had my very first chocolate egg cream, that fizzy concoction of chocolate syrup, milk, seltzer and no eggs. They featured heavily in the books that I read when I was younger and it was a bit of a thrill to finally taste one (it tastes exactly as you’d expect of the sum of its parts). Dessert was easy enough; we just crossed the street to an extremely crowded (it was Friday night) Il Laboratorio del Gelato. 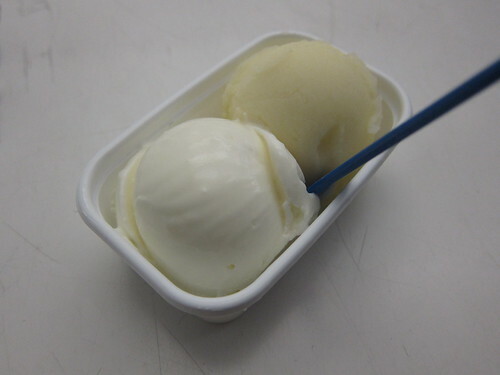 Their gelati do change often so not all of their 200 flavours will be available. My Greek yoghurt and lemon ginger were very refreshing and my taste of their olive oil flavour…well, tasted of exactly that! Don’t forget to get a ticket as soon as you get in there or else you’ll be waiting for ages! For lunch the next day, I brought another old friend and colleague back to Hill Country Barbecue for a brisket sandwich. A soft potato bun attempted to sandwich together a mound of peppery chopped brisket (both lean and moist) with lots of barbecue sauce. Good stuff. 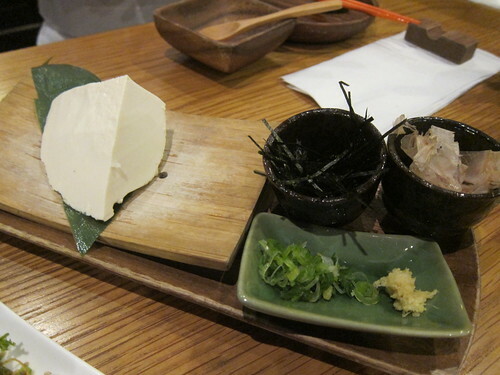 That night, I met up with Diana and Michele and we had dinner at Cocoron which specialises in homemade soba. Homemade soba! I’d certainly not tried that and it sounded excellent. 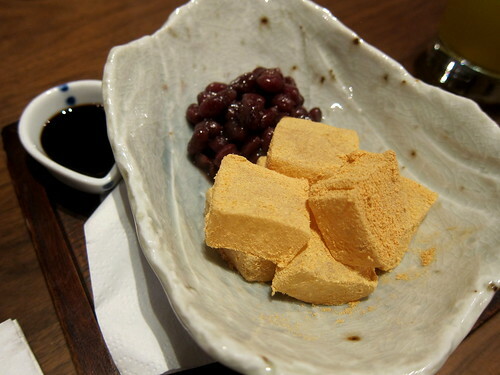 … and a refreshing off-menu homemade tofu. The soba! I chose a cold dish for that abnormally hot day; this was their sansai soba, which came with a whole myriad of vegetable toppings. I poured the dipping sauce on top, mixed it all together and slurped down the delicious and surprisingly al dente noodles. For my very last lunch in New York, prior to my evening flight, I went with a suggestion from Diana, who proffered the name of El Tenampa when I told her I had a hankering for Mexican food. I took a subway train further into Brooklyn and got out at what appeared to be quite a suburban neighbourhood. After walking a few blocks, I found El Tenampa, a Mexican shop (‘supermarket’ would be pushing it) with a cafe in the back. I arrived just before its noon opening time and so sat waiting in the dark with a couple of Mexican families. At noon, the lights were turned on and we queued to order at the counter. When our food was ready, we’d either be shouted at or pointed at if we were watching and it was up to the counter again to pick up your food. When you’ve finished eating, it’s back up to the counter again to settle your bill. The best and most stressful part of the whole experience was the trip to the salsa bar! What should grace the top of your tacos? There was green salsa, red salsa, radish slices, lime wedges, pickles and, rather amazingly, guacamole. Guacamole at a help-yourself salsa bar. 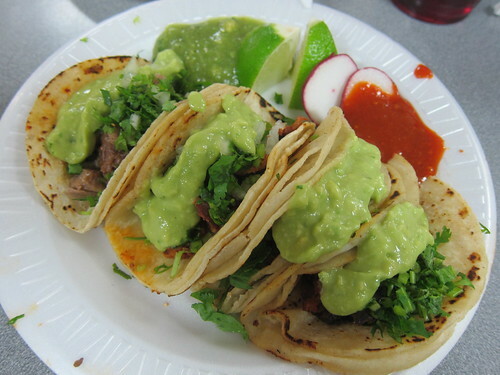 Of course, I guac’ed up all my chosen tacos: lengua, cesina, chorizo, and pastor. These were some legit tacos. I also had a tamal de mole. 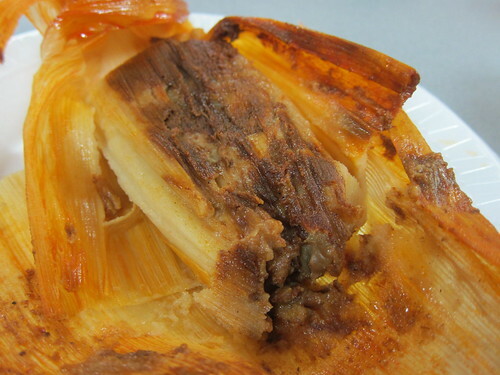 I love tamales and this was my first filled with the classic mole poblano sauce. To my surprise, there was a half a chicken thigh in there too, bone and all! 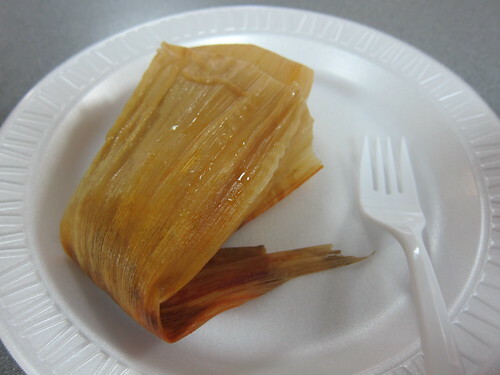 And this was one fine tamal. I’ve read good things about their cemitas and soups too. And one couple I saw had a brilliant idea: buy some of the fresh chicharrones at the front of the shop and bring it to the cafe to eat with lunch. I wish I had an El Tenampa near me! And that’s it! That was our big trip to New York this year! As usual, all our photos can be found in this Flickr photoset. 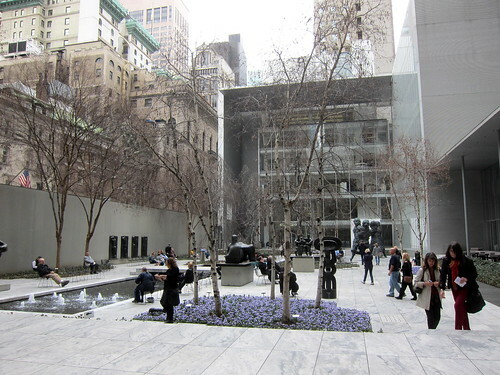 …and its calming Sculpture Garden. I love it. We could have spent all day here and we almost did; for lunch, we stayed in the museum and tried the restaurant on Level 2: Cafe 2. We were impressed with the food in the canteen-like setting (but there’s table service). The restaurants at MoMA are actually part of Danny Meyer’s Union Square Hospitality Group and they’re keeping some good company in their portfolio of restaurants. We split an antipasti tasting consisting of three of our chosen antipasti from a list. 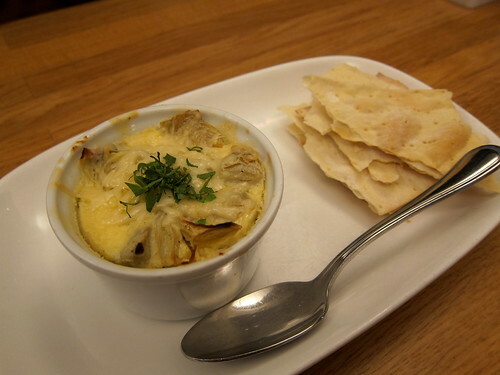 Artichoke gratin was plenty of sliced artichokes with hot cream and cheese, perfect for dipping into with their homemade carta di musica. 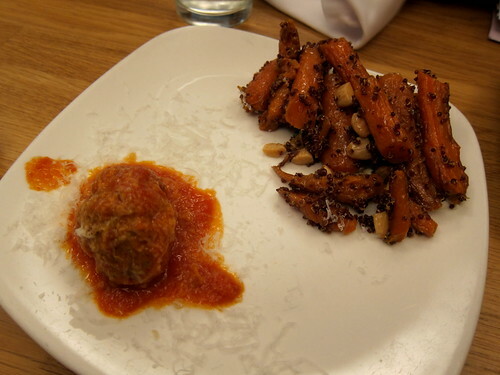 There was also a lone meatball (excellent though so lonely) and a brilliant roasted carrot salad with almonds and maple and yoghurt. 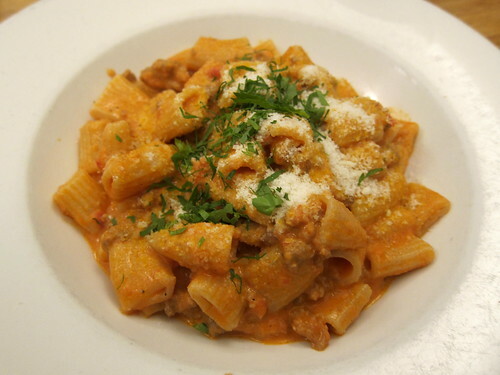 There was also a good-sized bowl of perfectly al dente rigatoni with braised pork-fennel sausage and a creamy tomato sauce. 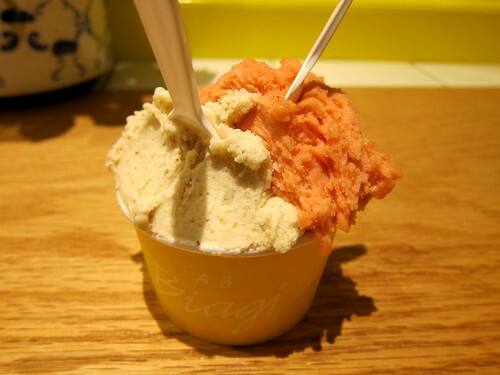 And, of course, for dessert, gelato. I’ve heard that theirs is from Il Laboratorio del Gelato though I don’t know if that’s the case anymore. 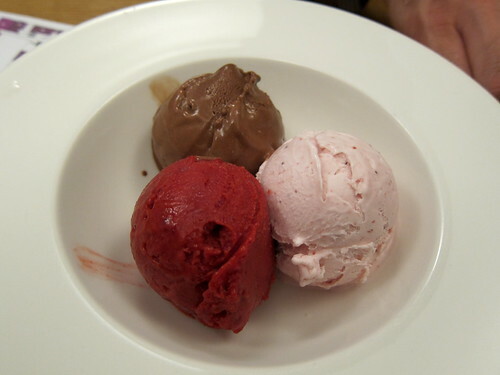 Whatever the case, the chocolate, raspberry and strawberry gelati we tried were very good indeed. 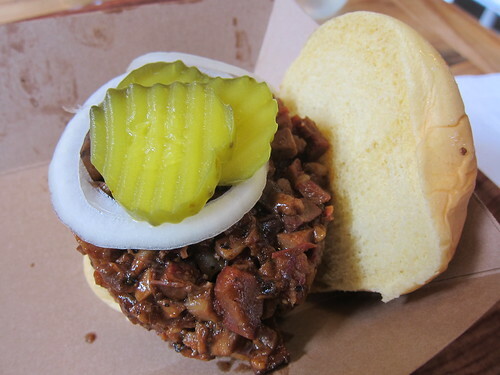 Good stuff overall – it’s definitely a big step up from the usual museum food. 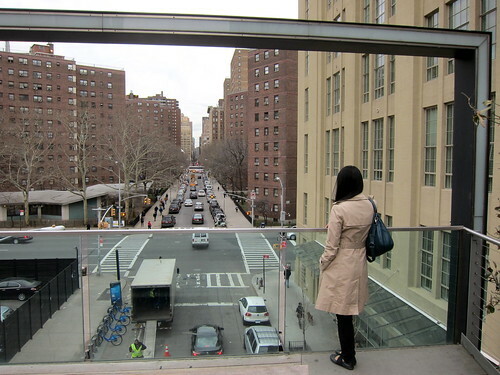 After our time at MoMA, we took a subway to the start of the High Line. This elevated park on former freight rail line wasn’t open when I was last in NYC and I relished this opportunity to see it this time. 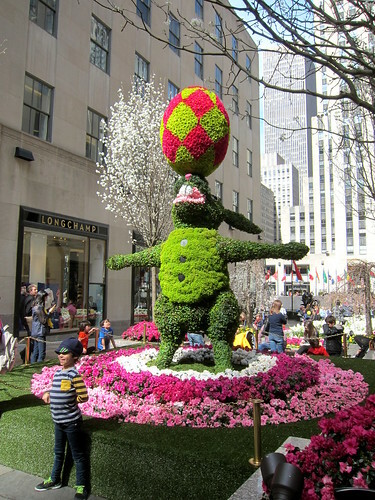 What a beautiful park – I loved the way the style of the park would change along its length! 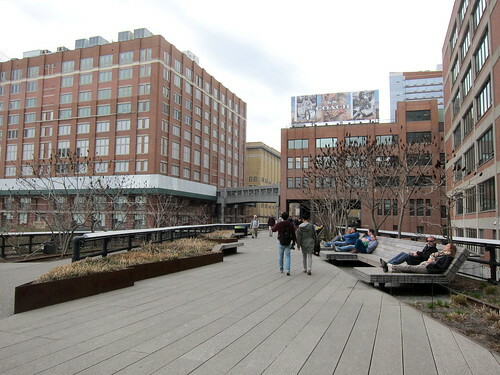 Seeing it on a weekday afternoon was excellent as it wasn’t too crowded but there’s lots of benches and it’s fantastic looking over the streets and if we had been hungry, it would have been easy to pop to Chelsea Market for a snack. We headed back to Brooklyn for dinner. We had spotted Hill Country Barbecue on our first night and it looked like a great place for a meal; we were not disappointed. The place was huge – we were seated and drinks were brought to us but after that, you’re on your own until dessert. 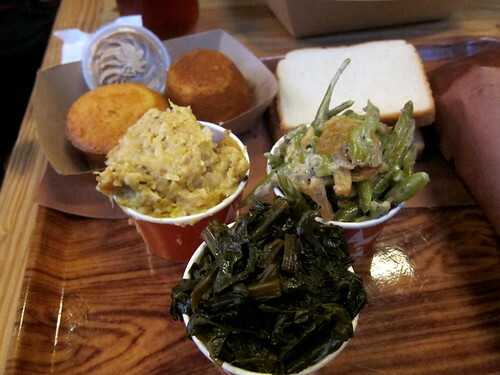 It’s up to you to bring your little order card to the counters to get your meats and sides. I got us a sampling of their moist brisket, a jalapeño-cheese sausage and some ribs. This was all wrapped in brown paper and placed on a tray. 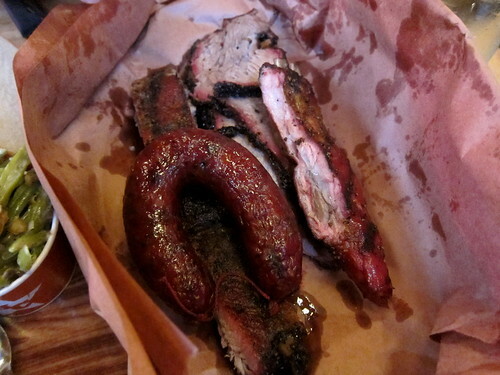 They were brilliant – I loved the tender peppery brisket and the mild cheesy sausage. The ribs too had a good chew to them and I had plenty of their barbecue sauce with them. I liked that you had a choice of sizes for the sides and we opted for the smallest to get a variety. White shoepeg corn pudding was a surprise, all sweet and creamy corn kernels. 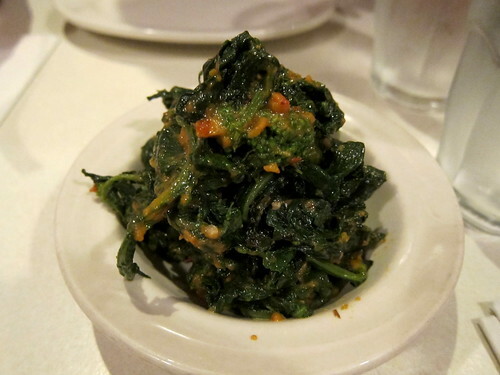 Braised collard greens had been cooked with smokey bacon. Green bean casserole was made in the traditional American manner with a creamy mushroom sauce and crispy french fried onions. Tender cornbread was served with whipped chipotle honey butter. All were excellent. The start of the 5th day was excellent. Unfortunately it was also Blai’s last day in New York as his flight was late that evening so the day was tinged with sadness. 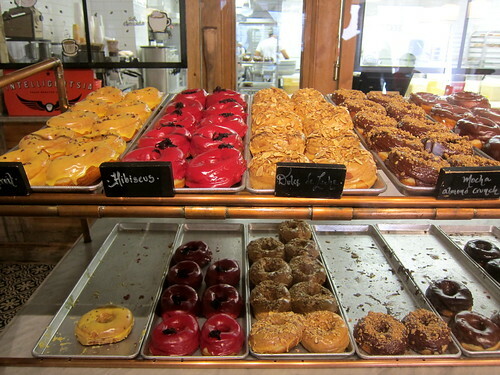 but we made it a super food day, beginning with a trip to the Dough outpost in Manhattan. …and a mocha. 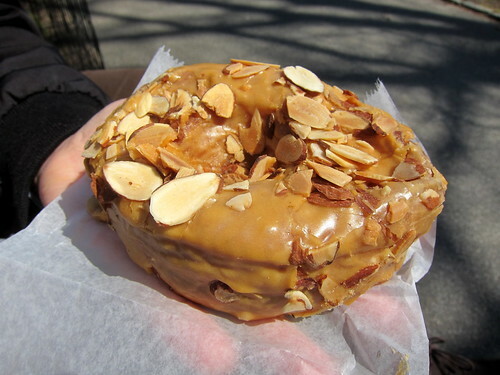 Yes, for us, Dough beats Doughtnut Plant – I like their doughnut texture and taste and their glazes. Well, no more doughnuts for me for a while. Oof. Then our walk took us through the West Village where we came across Pasticceria Rocco on Bleecker Street. I knew we had to walk in upon seeing their pastry display in the window and their sign proclaiming the best cannoli in the city! Blai had never had cannoli and we bought a mini one for takeaway. 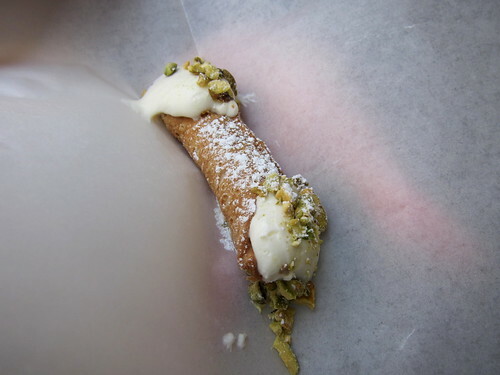 The ricotta filling was piped into the shell to order and we had a choice of pistachios or chocolate for the ends. It was fantastic. 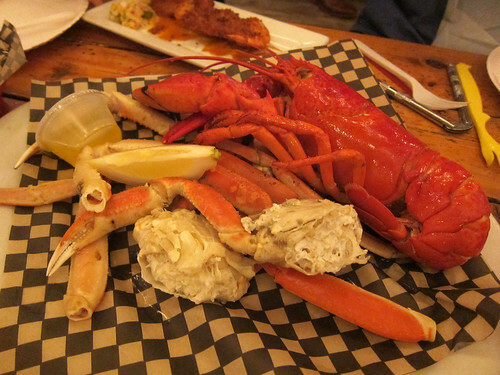 For lunch, it was back to another outpost of Luke’s Lobster at Blai’s request. 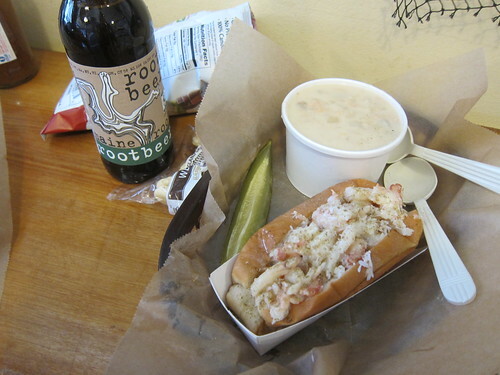 We skipped the lobster rolls and went straight for the crab rolls, with, of course, more of their clam chowder. 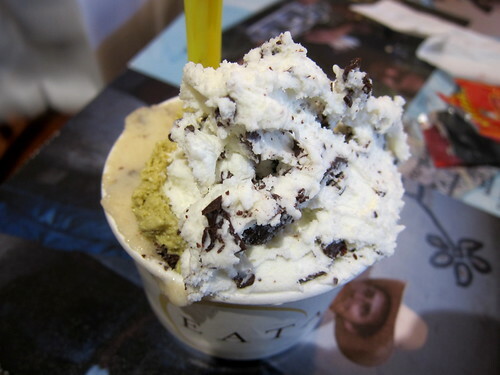 For dessert, it was off to Grom, the Italian chain of gelati shops. 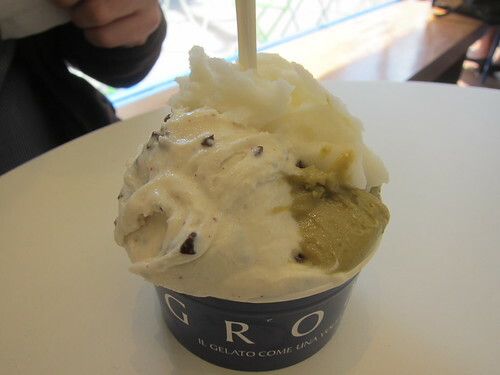 This was probably the best gelato we tasted in New York – Grom, please open in London! After a bit more wandering and a rest back at the flat, Blai was off! I was by myself now and work was starting the next day. I was supposed to meet a New York friend for dinner but due to a number of happenings, I had to cancel it as I had an early morning. But I still managed to get a good (and light) dinner in me at the Pok Pok Phat Thai. The small restaurant is one in Andy Ricker’s Pok Pok chain (which originated in Portland) and is next to Pok Pok NY and across the street from their Whisky Soda Lounge. The Phat Thai branch was probably the most casual and that Wednesday night, it was easy to get a seat for just me. 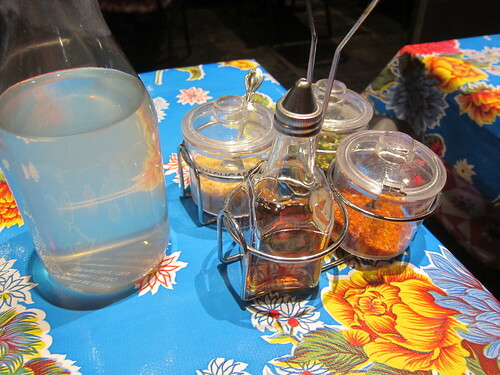 The tables were set with colourful tablecloths and all the proper Thai condiments were available. A nice touch was that the drinking water was infused with pandan. 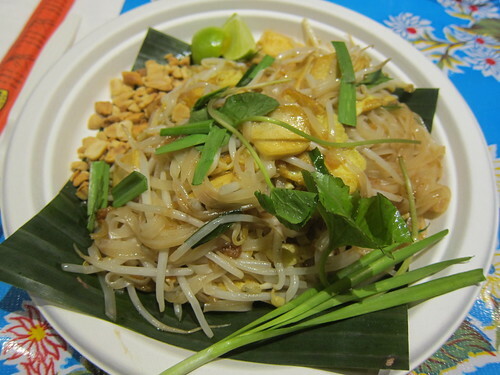 I chose the simplest phat thai on the menu, without the addition of large prawns or minced pork. 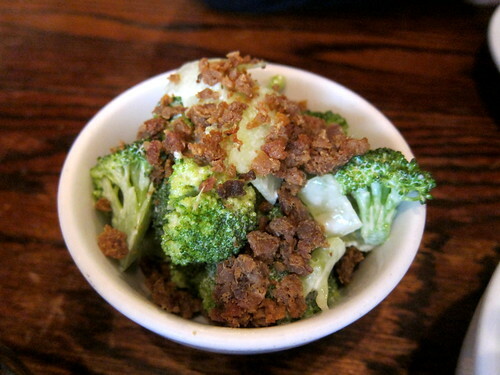 That’s not to say it was vegetarian – there were still dried shrimps giving lots of flavour. Excellent stuff and it hit the spot after all the rich eating the previous days. And then I was on my own in the city for work. 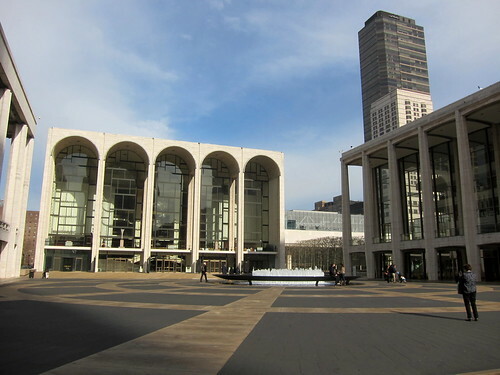 The morning of the third day started with a visit to Lincoln Center, the arts and culture hub I missed seeing on my last trip. 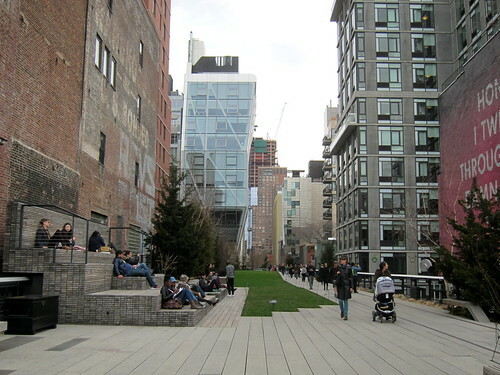 It’s certainly a beautiful space – lucky New Yorkers! 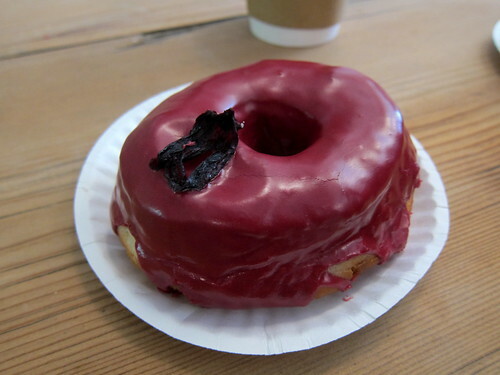 After a bit of wandering (and a disappointing avocado toast at ‘wichcraft), we found yet another Dean & Deluca where this time we tried a peanut butter and jelly doughnut from Doughnut Plant. Mmm…now I’ve heard great things about the doughnuts at Doughnut Plant, and especially about this particular doughnut, but it was just too much. 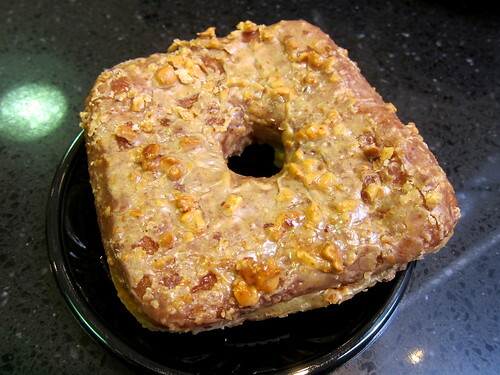 The dough itself was overshadowed by too much peanut butter, too much jelly. Perhaps I chose badly. 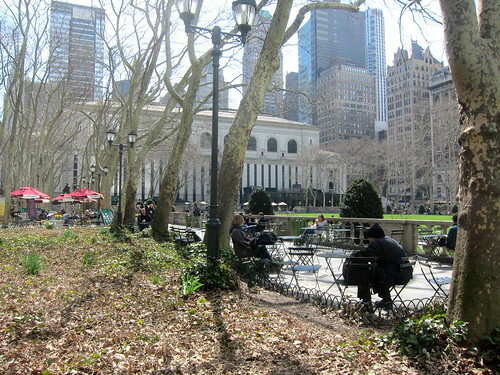 … and then down to Bryant Park and the New York Public Library where my favourite reading room was closed that day! A shame, I love that place. Lunchtime! We caught the subway from there to somewhere in East Manhattan to visit Momofuku Ssam Bar for lunch. I’d visited on my last trip to NYC and I wanted to return to try their lunch menu; ok, I was mainly there for their rotisserie duck. 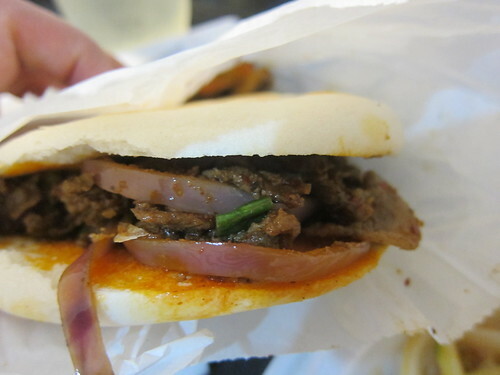 But first, their famous steamed buns again. 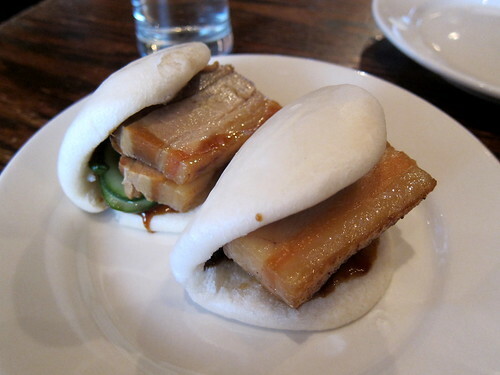 I think what makes them stand out from other pork belly buns are the not one, but two thick slices of braised pork belly. Indulgent! And that rotisserie duck! I would have liked more of it… but what we had was excellent. 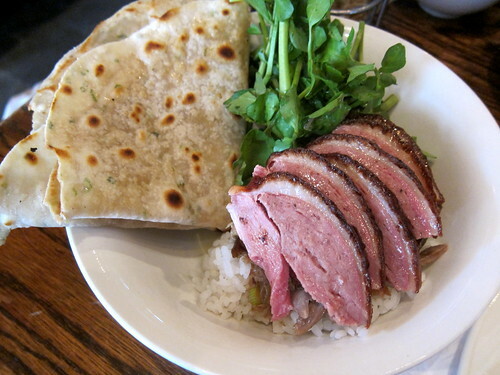 This is not your ordinary roast duck as in between the breast and skin was tucked some pork-based forcemeat. This is truly the mutant animal that would be welcome at my celebration table (bah to the turducken). 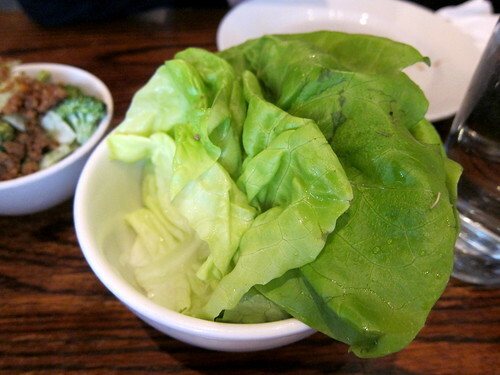 We got it with all the fixin’s available: the chive pancake above (only ok), the bowl of lettuce below (we weren’t entirely sure what to do with it and tried eating the duck ssam style), and an excellent broccoli salad with dried bluefish (below that). For dessert, we split a Thai Tea Pie, which whilst not tasting particularly strongly of Thai tea, was a delightful ice cream pie and a complex tang provided by a tamarind sauce. Afterwards we walked over to Momofuku Milk Bar which had not yet opened when I was last in New York. I’m sorry to say that I didn’t enjoy any of their sweets (I tried a few over a couple days). Their cookies (compost and corn) weren’t great to me and their cake truffles were bleh (dulce de leche). Perhaps I should have tried their soft serve. Their bagel bomb (a round bagel filled with savoury cream cheese) was quite good though. 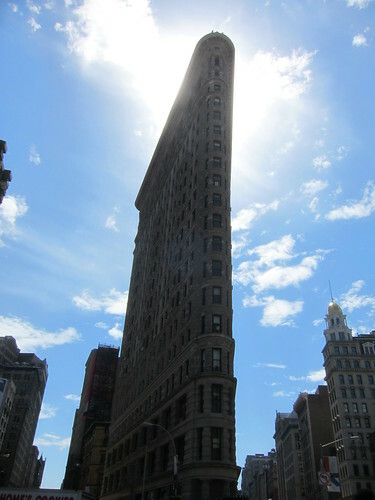 And then onwards we went to the Flatiron Building and where I spotted the city’s Eataly, that huge emporium of eateries, delis and shopping all direct from Italy. The sunny weather necessitated a gelato and we queued up to try that at Eataly. I mean, it’s from Italy so it has to be good, right? Wrong. The flavours were muted; the texture wasn’t great. Boring. Oh well, the rest of Eataly looked exciting. We didn’t have anything planned for the rest of the afternoon but we did want to see a few more galleries at the Met so back up on the 6-train we went. It’s impossible to see everything there in only a day or two and I wish we had a whole week for its! Later that evening, we headed back to the East Village (fast becoming my favourite place to eat in Manhattan) and while we first thought about pizza, the place we had in mind was extremely crowded. We turned the corner and headed for some American-Italian food at Parm instead. We started with some vegetables – spicy rabe was actually pretty spicy (to our surprise) but this heat paired well with the slightly bitter greens. 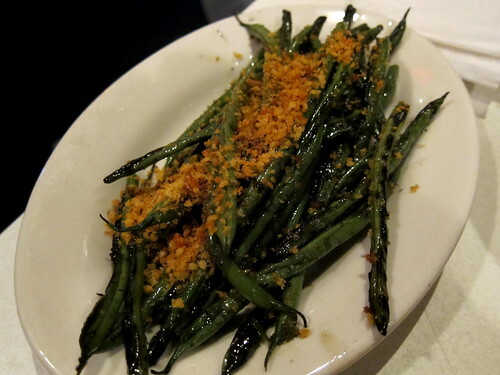 String beans oreganata were grilled until the beans were tender and will black grill marks and they were tossed with a spicy breadcrumb mixture. These were brilliant – I know I’ll try throwing green beans onto the barbecue this summer….when I get a barbecue. 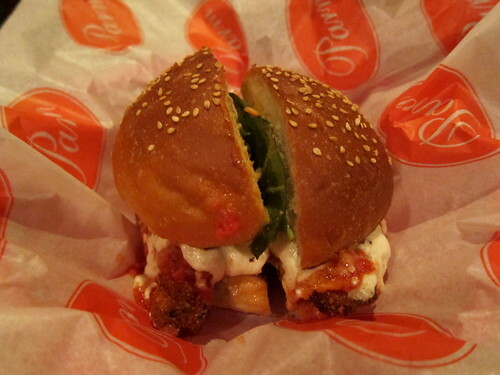 Of course, Parm specialises in anything parmigiana, i.e. anything topped with red sauce and cheese and it’s all melted together in the oven. We had a couple of small sandwiches. 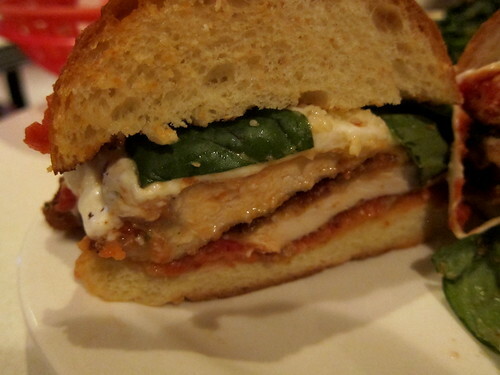 The chicken parm roll was breaded chicken with tomato sauce and melting cheese in a soft bun. 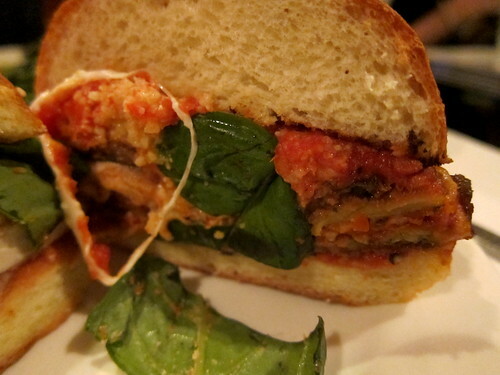 Eggplant parm (that’s aubergine if you’re not familiar with the Americanism) was silky slices of eggplant layered with the sauce and cheese. Both parms were excellent. After dinner, we ended up walking past the pizzeria again and this time it was empty. And open (ok, it was still very early in the evening). And that meant getting a slice. This was Prince Street Pizza, a tiny place that sells pizza by the slice – we were there for their square slice with spicy salami. 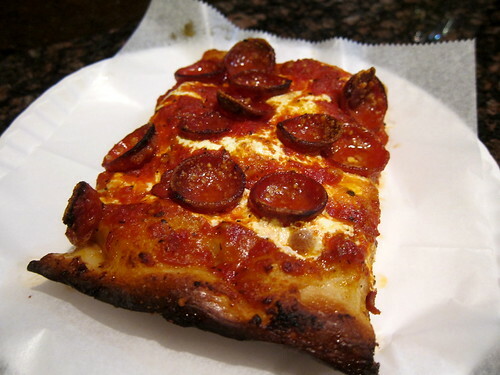 As recommended by Serious Eats, I asked for our slice to be extra crispy, meaning that it just spends a bit more time in the oven during reheating. A most excellent Sicilian slice this was – and we loved the crispy base. To make up for our crappy gelato earlier in the day, we walked around the corner from the pizzeria to AB Biagi‘s yet again! Here’s strawberry and a vegan almond. What made it vegan? Almond milk! It was fantastic. It was a good end to the day! 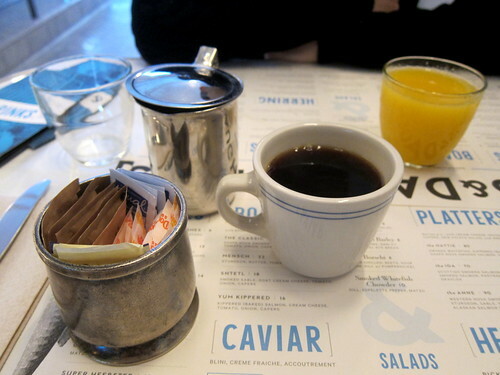 The second day saw us wake up again stupidly early but that meant we could get to Russ & Daughters Cafe before 9am on Sunday for breakfast (no bookings are taken). There we were served by a very serious young man who declared that everything we selected was a “good choice”. Coffee and freshly squeezed orange juice were necessary to get our internal engines going. Are kasha varnishkas a typical breakfast food? Probably not but when topped with a poached egg, it sure felt like one. 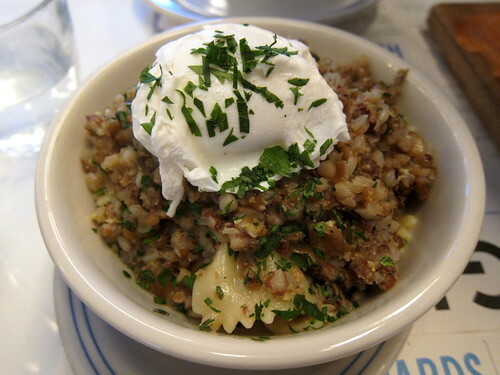 This Jewish-Ashkenazi dish of buckwheat and pasta and caramelised onions was supremely comforting with its butter and possible schmaltz. 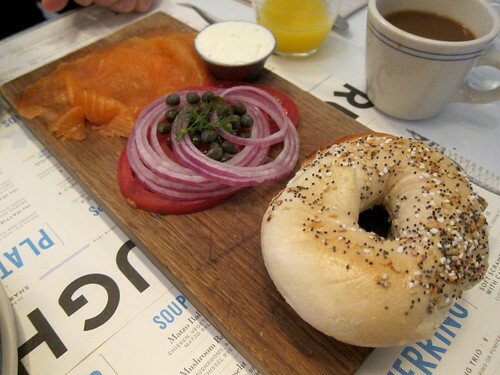 We also split a Classic Board – Gaspe Nova smoked salmon, cream cheese, tomato, onion, capers – all served with an everything bagel (“Good choice!”). The salmon was excellent and I loved their bagel. By the time we left, the place was packed and people had started queuing for a table. Yeah, get there early. 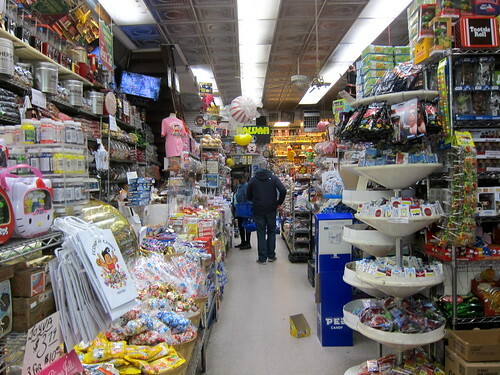 A short stroll away was Economy Candy, the legendary candy shop that’s been going since 1937. What a fun place this is! The proprietor asked Blai if he was taking me on a first date there (apparently that’s common) but when I explained that we’re not from around there, he quipped, “I could tell – you’re here early!” True that! It wasn’t even 10am then! We ended up leaving there laden down with goodies. 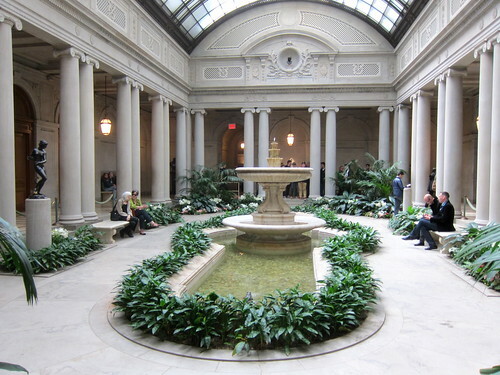 We then caught another 6-train up to the upper east side (we got very familiar with that subway line) and spent the rest of the morning at the Frick Collection. If you get there between 11am and 1pm on Sundays, it’s pay what you like. It’s a fine little collection that’s definitely worth seeing! 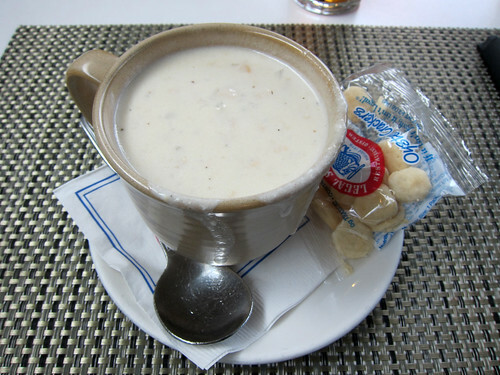 … and a side of their Boston clam chowder. It was fantastic. 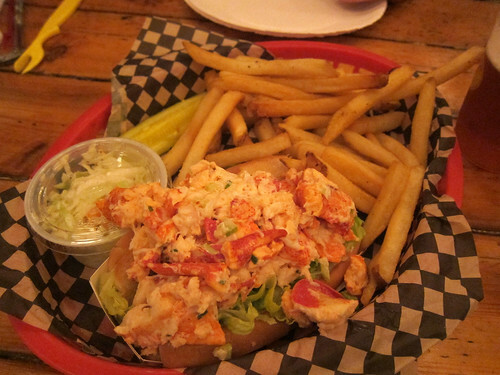 Those buttery toasted rolls were chock full of shellfish with just a tiny bit of mayo and a sprinkle of something heavy on celery salt. Fabulous. I’d never seen Blai so enthusiastic – he demanded, demanded!, that we return on his last day in the city. Seriously, I can count on one hand the number of times he’s demanded some particular dish and this was almost shocking! But they are worth the enthusiasm! 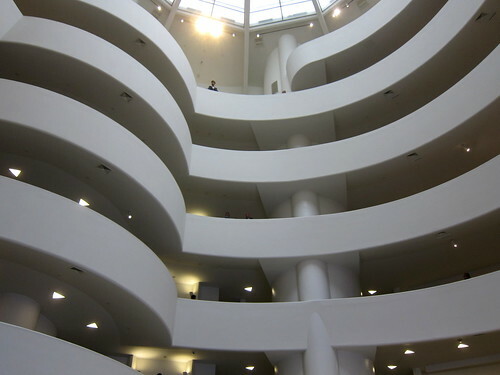 And then it was onwards to the Guggenheim. While the building was quite spectacular, as was most of their permanent collection, we were disappointed that one main gallery was closed and that most of the space was dedicated to a major exhibition by On Kawara. Now, Kawara’s work is interesting as a concept but seeing a lot of it there (and it’s quite repetitive) got tiring after a while. 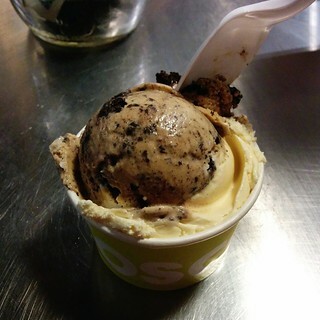 After our time at the Guggenheim, the warm weather had us thinking about gelato and we took the subway back down to the East Village and headed to A.B. 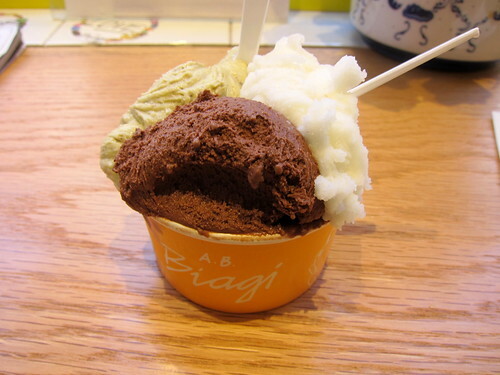 Biagi, which I’d heard had some excellent stuff. The shop was much smaller than I expected (there were only three seats inside) and the menu was equally tiny (maybe about 5 flavours that afternoon) but what we tried (lemon sorbet, chocolate and pistachio) were all excellent. Somewhere in between gelato and dinner was another subway ride down to Battery Park to bask in the sun and peer out at the Statue of Liberty and a long walk back to the subway as a few stations were closed around Wall Street due to filming of some movie. Ah, New York! Dinner that night was back near Chinatown on Canal Street at Pies ‘n’ Thighs. 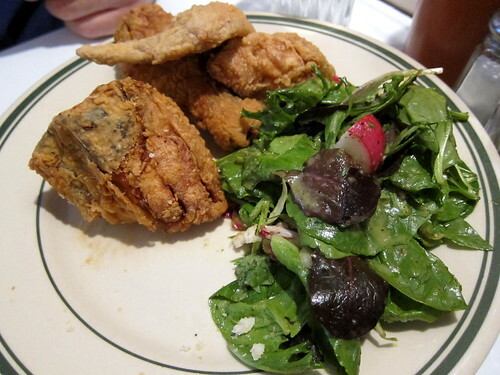 Three pieces of fried chicken made up their Fried Chicken Box and on the side, we had a lovely refreshing green salad. The chicken was excellent – moist on the inside, seasoned goodness on the outside. Oops, I think a piece of chicken was already missing from the plate when I took this photo. And there was a biscuit on the side. I miss biscuits so. We also split a chicken biscuit. 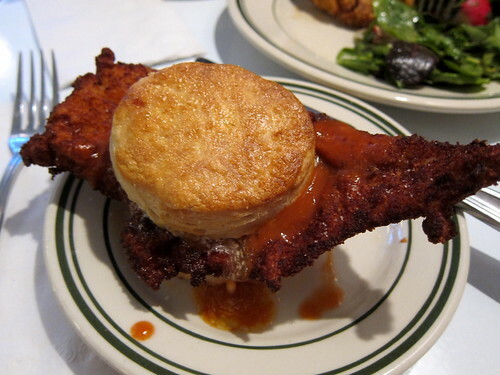 This chicken breast had been coated in a crumb coating and was slapped between a biscuit with lashings of honey butter and hot sauce. Mmm… honey butter and hot sauce. Excellent stuff. 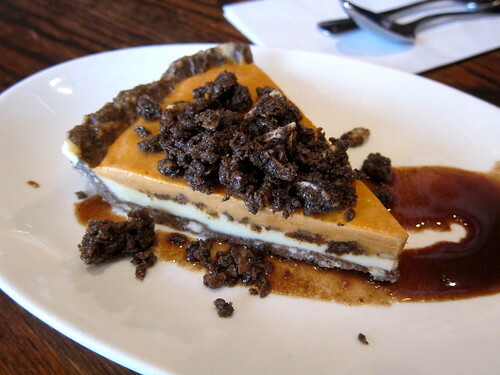 We couldn’t leave without a slice of pie! 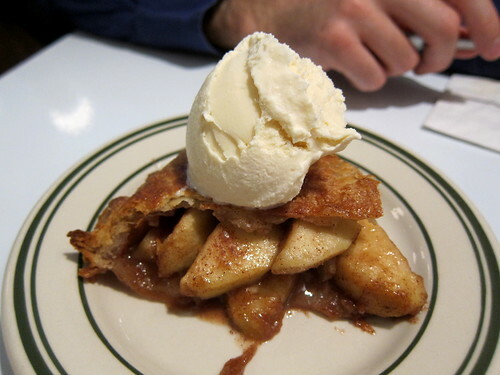 Here’s their apple pie a la mode, which was just ok. The crust could have been flakier and the apples cooked a little longer. And that was our second full day in the city. When I look back at it, butter seems to have been the running theme throughout the meals. It’s difficult to believe that we were in New York City last week! It was only my second time but Blai’s first time and we were gonna hit all the high spots and, of course, eat well! We flew American Airlines direct to JFK and I was pleasantly surprised by how much space we had and quality of the food provided. What wasn’t so great was the flight taking up most of Friday, which meant that we landed mid afternoon Friday, checked into our Airbnb apartment in downtown Brooklyn, and then went directly to find dinner. 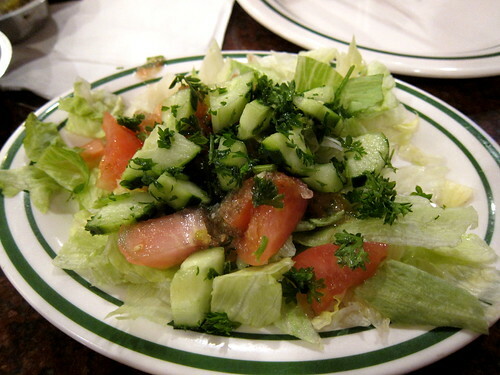 My friend Diana had sent over a huge list of delicious places and one really jumped out at me – Yemen Cafe & Restaurant on Atlantic Avenue, only a 15 minute walk from where we were staying. 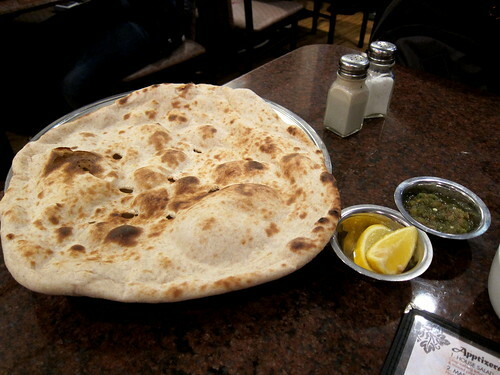 As soon as we sat down, we were brought a huge round of warm clay oven bread, lemon wedges and zhoug, the fresh green and spicy sauce served with Yemeni food. 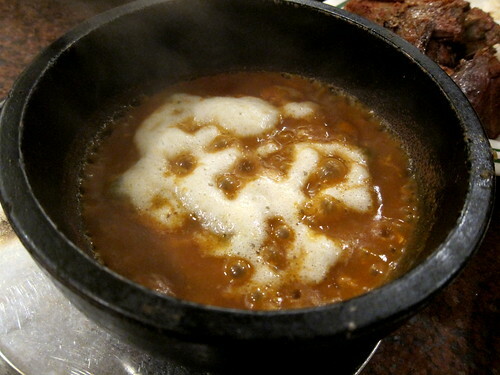 Two bowls of lamb soup were also presented to us. It smelled very lamby but its flavour was much gently than that which its scent hinted. And a plate of salad! 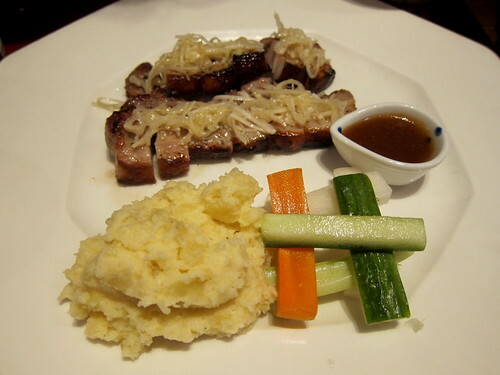 This, we think, accompanied our main course and was brought as a sort of starter. Being somewhat wary of American portion sizes and not wanting too much waste on our trip, we ordered only one main course and one appetiser to split between us. 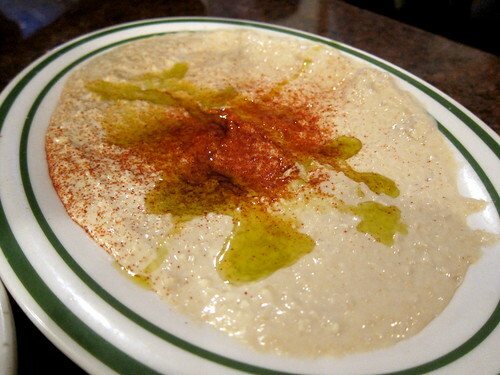 Weirdly, we wanted something quite comforting and ended up with hummus! It was excellent homemade hummus and we ate probably way too much of that round of flatbread with it. And then our main course, the Yemeni national dish saltah, arrived. 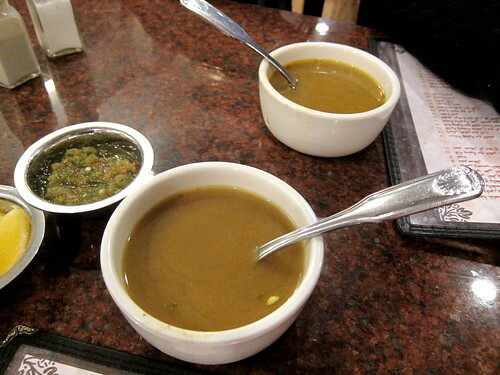 This was a hot stone bowl of a thick, slightly gelatinous vegetable stew topped with a frothy fenugreek sauce. 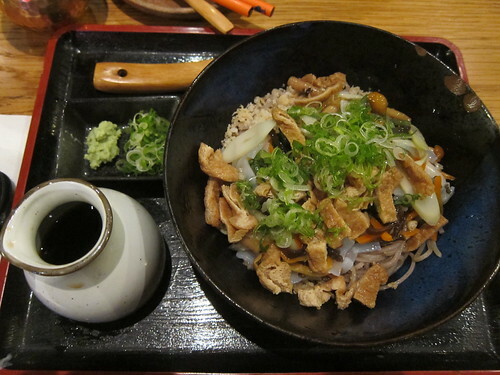 We stirred our bubbling bowl hesitantly…and ate a little with rice. Then we tried it with bread and knew that we were onto a winner. It really is best with the warm flatbread – somehow the stew (with okra being the thickening agent) went amazingly well with it. I need to find saltah in London! What we should have done was follow the lead of the Yemeni guy at the next table who dumped in a couple spoons of zhoug and stirred vigorously before tucking in with his wife. He was impressed by how we cleaned our bowl though! 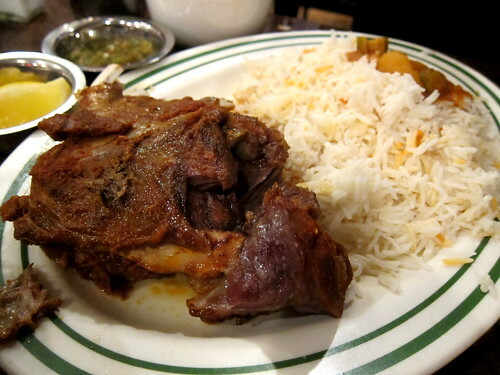 The saltah came with a portion of their lamb haneeth, a falling off the bone chunk of tender spiced slow roasted lamb. The rice we ordered as a side dish and that highly scented pile of spiced basmati came with a little drizzle of saltah sauce on it. And to drink? 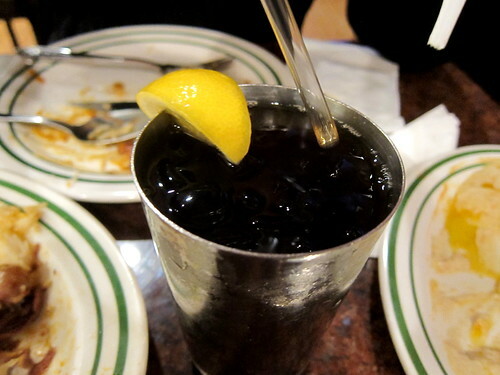 Iced Yemeni tea, which hit the spot. Our first proper day in the city started early… like 6am early. 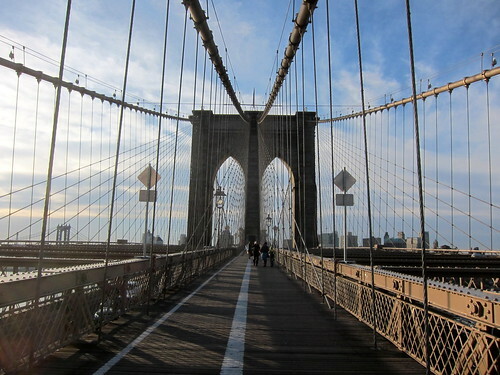 Jetlag had hit us a bit and we used that early morning to walk over the Brooklyn Bridge into Manhattan. 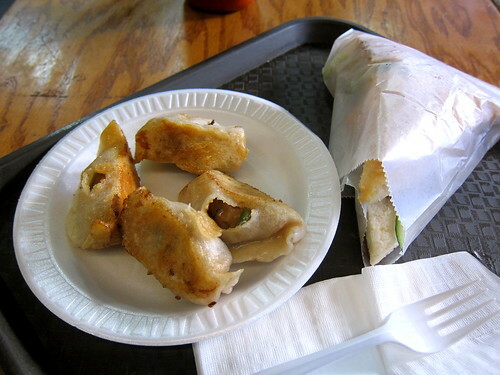 After walking for a bit (and having a bit of tea somewhere), we found ourselves in Chinatown and we headed for a place on my list for cheap dumplings (also, it opened at 7am, which was useful) – Vanessa’s Dumpling House. One order of fried pork and chive dumplings and a veggie filled pancake (a thick wodge of soft bread) saw our tummies filled for under $4. Bargain. 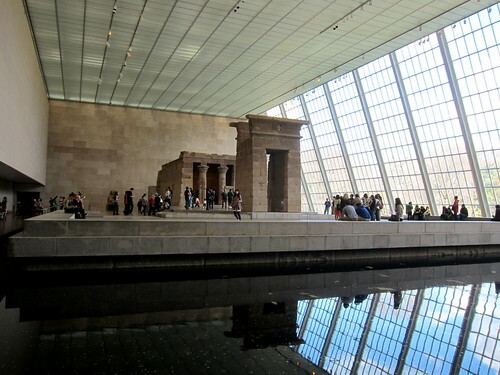 Then it was catching the 6-train and visiting the Metropolitan Museum of Art, one of my favourite places in the city and where we spent most of the day. All that walking through the galleries builds up an appetite! We walked (some more) to a nearby Papaya King and grabbed hot dogs to eat in Central Park. 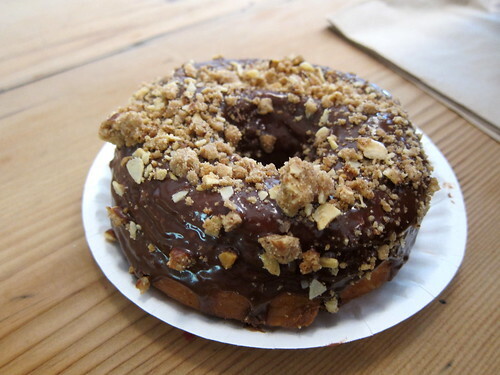 On the way, we also ran into a Dean and DeLuca (the upscale grocery store) and picked up a doughnut from Dough. It’s here I need to mention the fantastic weather we had during our week there. Thumbs up! Anyway, lunch was great! Papaya King’s hotdogs were excellent (no, I couldn’t tell any difference from Gray’s Papaya from my last trip) but as for topping, I don’t really get the New York onions, a stewed mixture that hints of cloves and cinnamon. 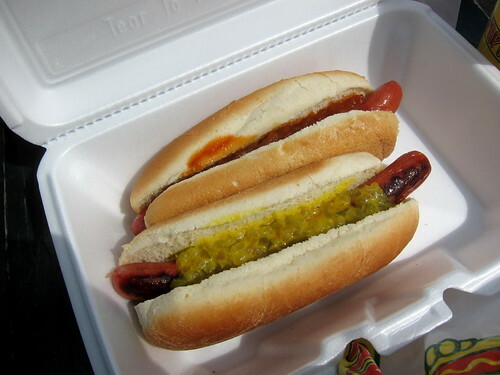 I preferred the relish – pickle relish mixed with mustard. Their corn dogs and curly fries are excellent too. And that doughnut! Oh, it was brilliant – this was a dulce de leche one with icing that wasn’t too sweet and topped with lots of toasted almond slices. After lunch, we returned to the Met again! And still, after spending most of the day there, we didn’t ever make it to the second floor! 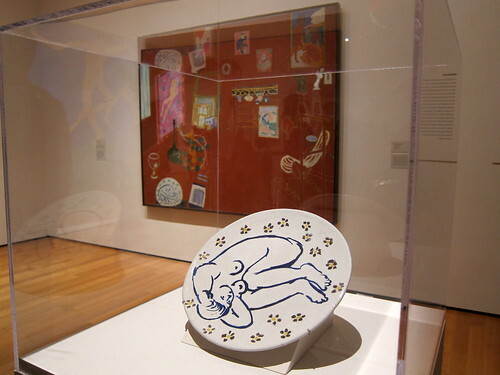 All that walking around the Met was killing our feet and we needed another sit down mid afternoon. 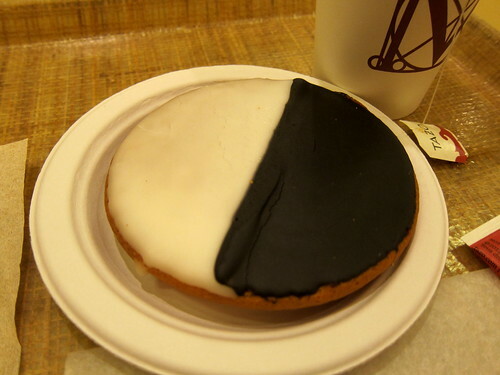 Tea and a snack then and that snack was our very first black and white cookie, a New York classic. It was alright (soft cakey cookie with icing) but I didn’t see the great appeal of it. One final round through the Oceania galleries (fantastic) and it was time to go. Dinner, as is normal for any jet-lagged traveller, was required a little earlier than usual. However, our chosen restaurant, Ootoya in Times Square, had a one hour wait for a table (it was Saturday night). No matter – we waited in the Starbucks next door. When we finally sat down, we were ravenous. My kaasan ni set was a stoneware bowl of chicken katsu in a soy-dashi broth topped with lots of grated daikon and a poached egg. 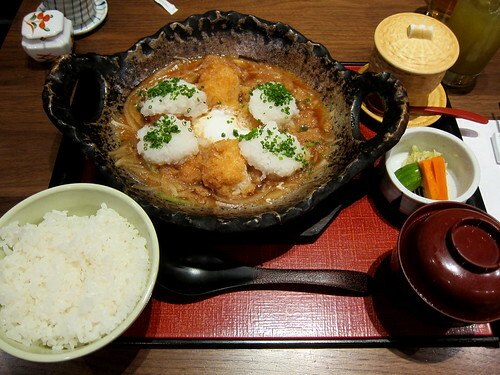 I ordered this as a set, with rice, miso soup, steamed egg, and pickles. 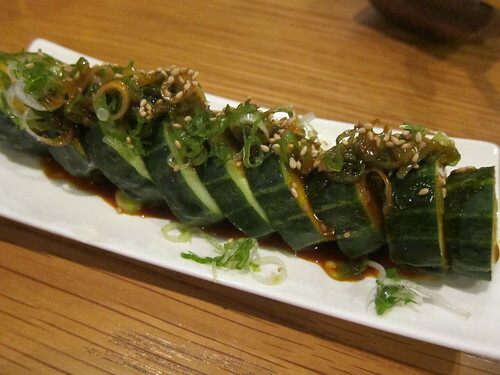 Blai’s buta shio koji with negishio was fantastic – the pork belly had been marinated in shio koji before being grilled and were then topped with sliced spring onions that too had been in shio koji. It was so utterly savoury and moreish. Altogether it was a lot of food! I only just about managed to squeeze in some warabimochi (another big portion!) at the end! And that was only our first 1.5 days in the city. 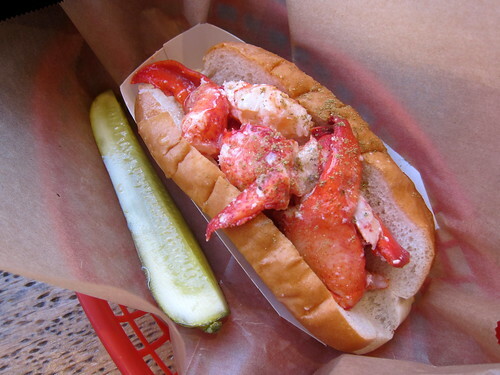 Like I said previously, Boston was full of good eating and I wanted to put together a post of the bits and pieces I had throughout the week and they’re listed here in no particular order. One afternoon, I skipped the conference lunch and headed off looking for my own, better one. 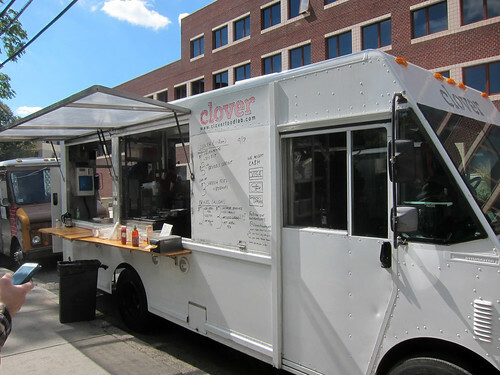 I came across a series of food trucks near Kendall Square in Cambridge and the name of one caught my eye – I’d heard good things about the Clover Food Truck. They have a few trucks and even a few proper restaurants now. 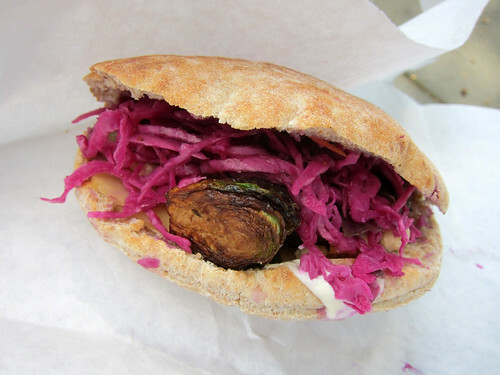 It’s only at this truck though that you can get the Brussels Sprout – a sandwich of fried brussels sprouts, cheese, pickled red cabbage, hazelnuts and a garlic sauce. It was fantastic – I love fried Brussels sprouts and making them the centrepiece of a sandwich is genius. Our table was full! 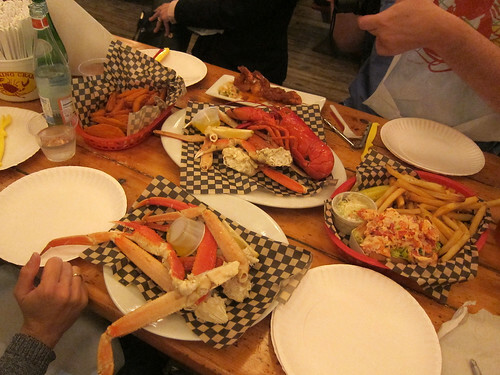 The Barking Crab has its critics but we all had a great time with great food. I really need more crab legs in my life. I took the opportunity to try the Bonchon on the Harvard campus while I was taking a look around. This is a Korean chain of restaurants that are famous for their Korean fried chicken. I wasn’t able to order from their lunch menu (only available on weekdays) so had to make do with the a la carte menu (which was also full of other classic Korean dishes). I ordered the smallest possible order of wings in their famous hot sauce and a side order of rice; the wings came with pickled radish (fine) and coleslaw (watch out for the garlic!). The wings were outstanding – the skin of the chicken was shatteringly crisp, even towards the end of the meal and there was a pleasing heat in the sauce that made my lips tingle happily. Please come to London, Bonchon! For most of the week, I stayed at a hotel a stone’s throw from Toscanini’s Ice Cream in Cambridge. The New York Times calls their ice creams the best in the world but I’m more content with calling them the best in Boston (sorry, the gelati in Italy wins hands down!). Coffee Hydrox and Creamsicle were both very very rich – their full cream ice cream is some seriously heavy stuff. The flavours were good though not mindblowing. 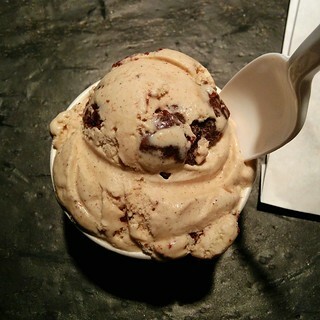 I did better after I got recommendations on Instagram – this is their B3 – brown butter, brown sugar and brownies. I also heard good things about their burnt caramel but never got around to trying it. I had one day off in Boston and, this being by first time in the city, used it to walk along the Freedom Trail. I diverted a bit on Hanover Street to get myself to Mike’s Pastry for one of their famous cannoli. It’s not difficult to find – just go in the opposite direction of the happy looking people clutching bakery boxes from the shop. 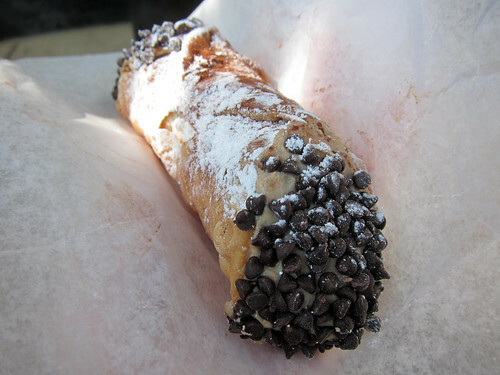 I battled my way through the indecisive crowd and got myself an espresso cannolo. 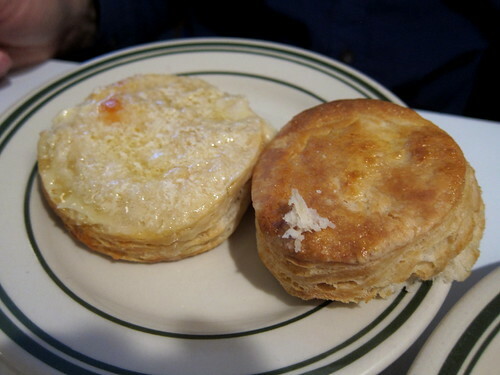 The fried pastry was wonderfully crunchy even when filled with the cream (the filling is much lighter in texture than the Sicilian ones I’ve had in the past). It’s definitely worth the detour. 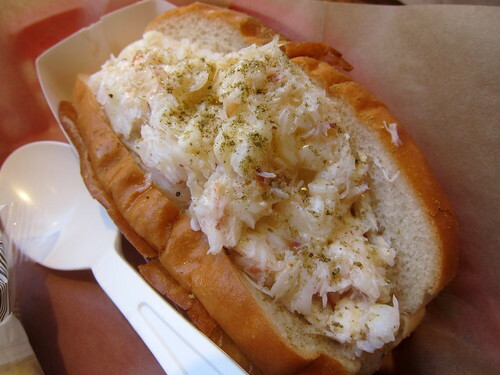 Finally, I can’t finish the series on Boston without mentioning Legal Sea Foods. 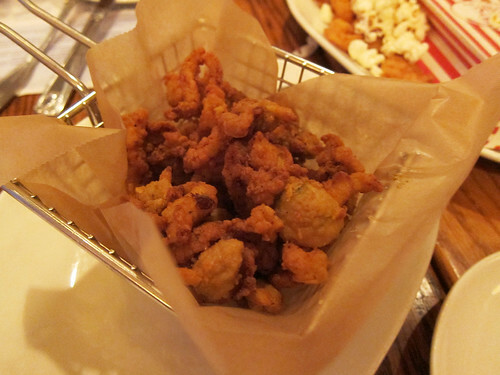 We went to the branch at Kendall Square (Cambridge) for a work dinner on our first night there and the selection of starters we split first really shone compared to the mains – here were their excellent New England fried clams. Or maybe I just filled up on the starters and didn’t have a chance to properly appreciate my crab cake. Hmm. 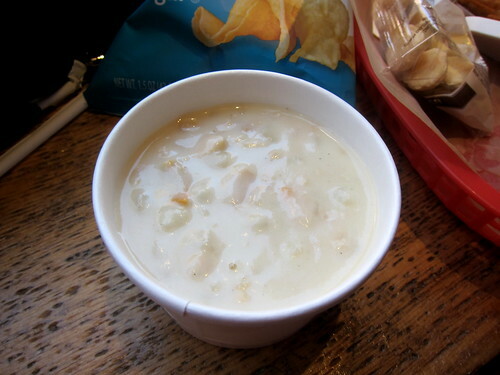 I even found time to fit in a final cup of their fantastic clam chowder at a branch at Logan International Airport (there’s a Legal Sea Foods at every terminal, I believe). It was a good end to the trip. And that’s it for Boston (and Cambridge)! As is usual, all my photos from Boston (and photos from my walk along the Freedom Trail) can be seen in this Flickr album. I wanted to treat myself on my last night in Boston and, from what I could see online, Craigie on Main in Cambridge was exactly what I was looking for – serving modern cuisine made from local ingredients. With a James Beard Award winning chef (Tony Maws) at the helm and with other numerous awards, it was certainly going to be good; I booked myself in for a solo dinner on a Friday night. When I arrived that evening, the place was packed, again a consequence of that ridiculously busy weekend, but the hostess, seeing that I was by myself, did her best to seat me as soon as possible (and at a lovely window seat overlooking the entire restaurant too). Service overall was excellent – my waitress had already picked up on the fact that I was from out of town (the mobile phone number for my booking gave that away). A number of options were available in the evenings, three courses of your choice, a 6-course tasting menu and an 8-course tasting menu. It was the 6-course tasting menu ($98) for me. 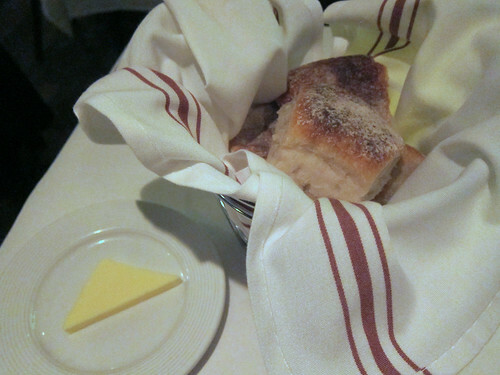 Bread and butter were promptly set before me and I tried my best not to fill up on it! 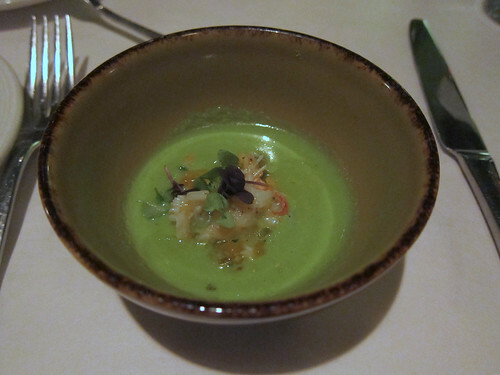 The meal started with an amuse of green tomato gazpacho with golden raisins and peekytoe crab. I loved the slight tang of this cold soup and the raisins and crab added a good balancing sweetness to it. I never would have thought of eating green tomatoes in this way. 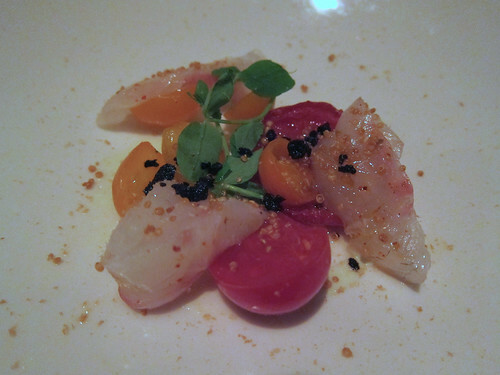 The first of the tasting menu’s six courses was sashimi of madai with heirloom tomatoes, a confit tomato and crispy quinoa. I enjoyed this light start and could see that this was going to be a good meal. Actually, all the tasting menu dishes surprised me that night as I had originally expected perhaps smaller versions of the dishes on the a la carte. But this wasn’t the case – everything was original. 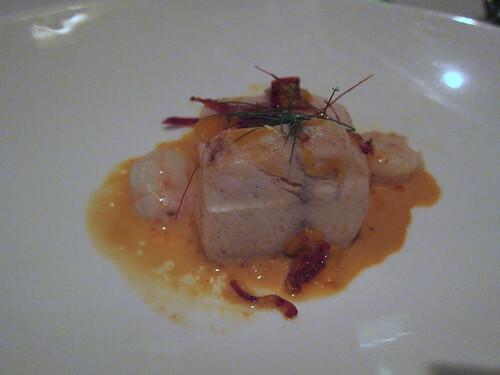 Another fish dish came next – slow cooked swordfish and shrimp in lobster sauce with seabeans and chorizo. The textures of the seafood were incredible, both turning out completely differently after slow cooking – the meaty swordfish and the silky shrimp. 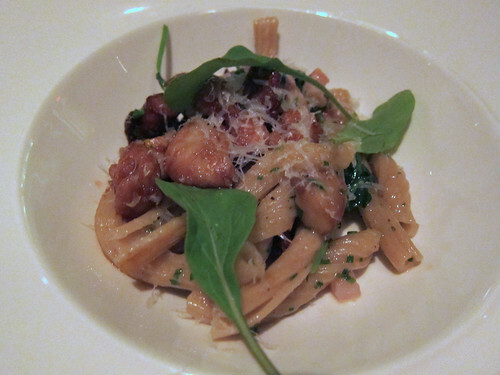 I loved the handmade trofiette pasta with sweetbreads and mushrooms that came next. The mushroom sauce coating the pasta was incredibly rich and the fried sweetbreads made it all even richer. Heaven. For the meat course, I was surprised to be presented with lamb – it’s not a meat I come across very often in North America. 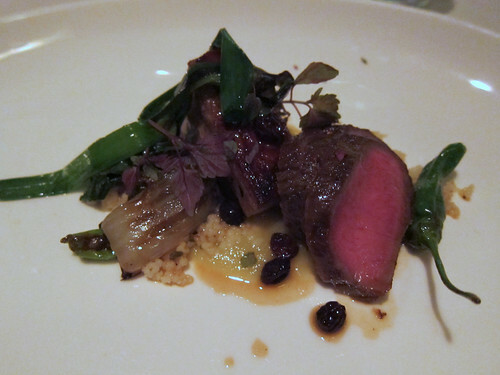 Here was lamb two ways – confit belly and leg (I think?) served with couscous, green tomato puree and shishito peppers. And it really was some of the best lamb I’d had all year. 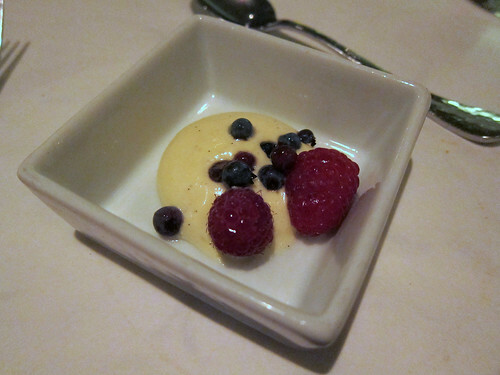 I was then presented with the first of my sweets: a Riesling sabayon with local wild blueberries and raspberries. While this was tasty, I did think the portion size was a bit mean. And with the second dessert being light and fruity, I did wish that this was something richer. 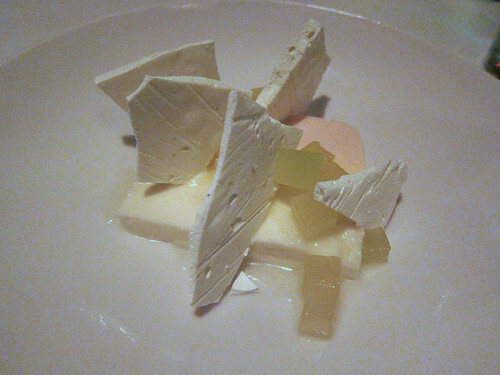 The light and fruity second dessert was a melon sherbet terrine with compressed spiced melon and mint meringue. This was a lovely end to the meal – very refreshing. Overall, it was a great meal and a great end to the trip. By the way, I hear they also serve an excellent brunch (I had originally planned a brunch there but the schedule didn’t allow for it).